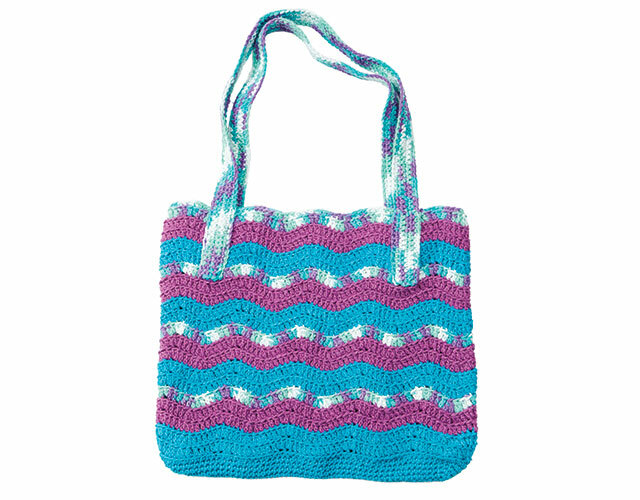 Learn how to crochet a fabulous ripple pattern while completing a roomy tote! Join expert designer and instructor Sharon Silverman and crochet along with her, step by step! Work an eye-catching ripple pattern with two solid colors and a coordinating variegated yarn. Form the base of the tote bag by crocheting around both sides of the beginning chain. Form an attractive ridged texture by working in the back loops. Form the hills and valleys of the ripple by working increases and decreases. Crochet and attach handles for carrying your tote. Follow the pattern in written instructions and symbol diagrams. Block the tote to define the stitches and square the project. Class includes complete step-by-step instructions, symbol stitch diagrams and materials list for the Go-To Ripple Tote. Learn to Crochet Ripples streaming online class and DVD include full video and written instructions to make the Go-To Ripple Tote. If you purchase Go-To Ripple Tote single-project online workshop and later purchase Learn to Crochet Ripples, you can receive credit for the single-project workshop by emailing Customer_Service@AnniesCraftStore.com or calling 1-800-282-6643. Great class and an easy pattern. The instructor was great and her directions are very easy to follow. Patterns are easy to do.